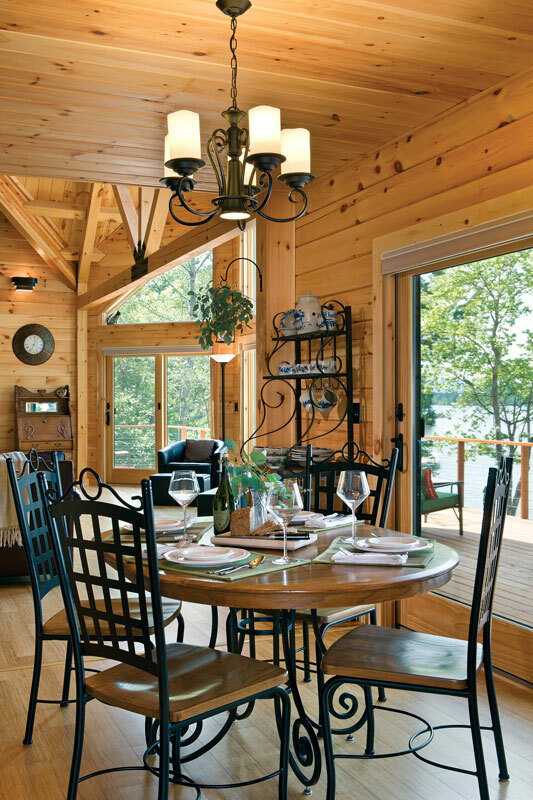 A couple leaves their high-pressure city life behind for a laid-back early retirement log home in New Hampshire's Lakes Region. Greg and Kym Lagios worked long, hard hours at their corporate careers in the Boston area. Their efforts paid off, though, earning them enough to afford early retirement. 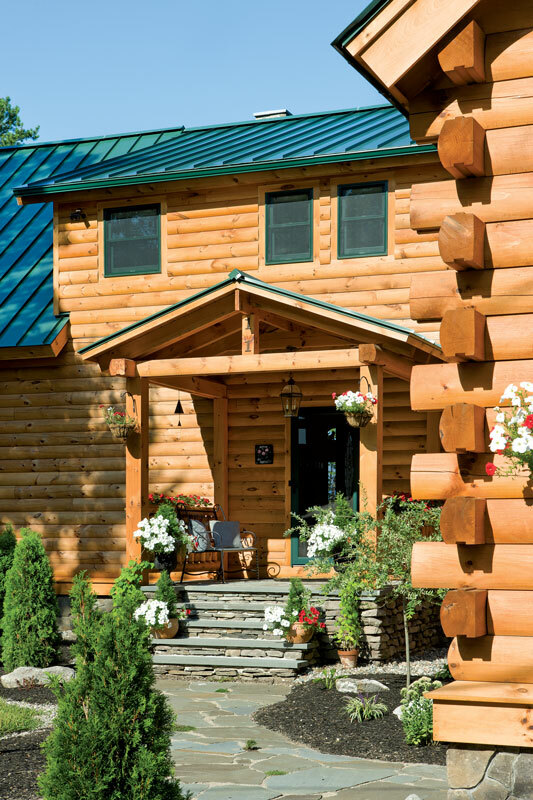 An existing house came with the property, but the couple knew they wanted a new log home because they had previously built one. 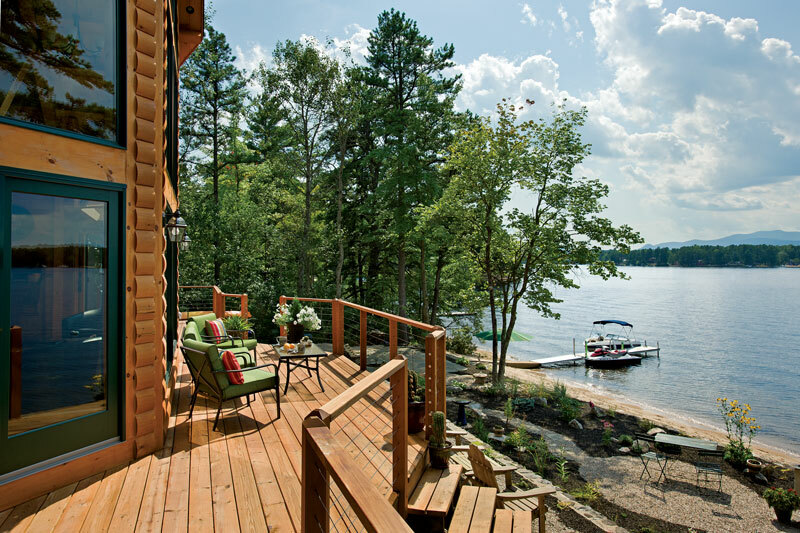 Choosing Coventry for their new home, Greg and Kym designed it with an emphasis on capturing the lake views from every room. As a result of their planning, the lake side of the 2,975-square-foot home faces west, capitalizing on maximum light, as well as solar gain during the winter months. The main living spaces, including the master suite, are on the entry level of the home. The second floor, designed to accommodate guests, includes bedrooms with comfortable sitting areas, affording privacy for all. A 930-square-foot room above the double-bay garage serves as the couple’s workout gym. The Lagioses spent a couple of months sketching an initial design, then took their drawings to Coventry’s design and drafting department. After Coventry completed the working blueprints, Habitat for Humanity came in and stripped the existing ranch home of everything salvageable. Then the demolition crew dismantled the rest of the house. E. F. Dolaher & Sons Contracting handled the construction. 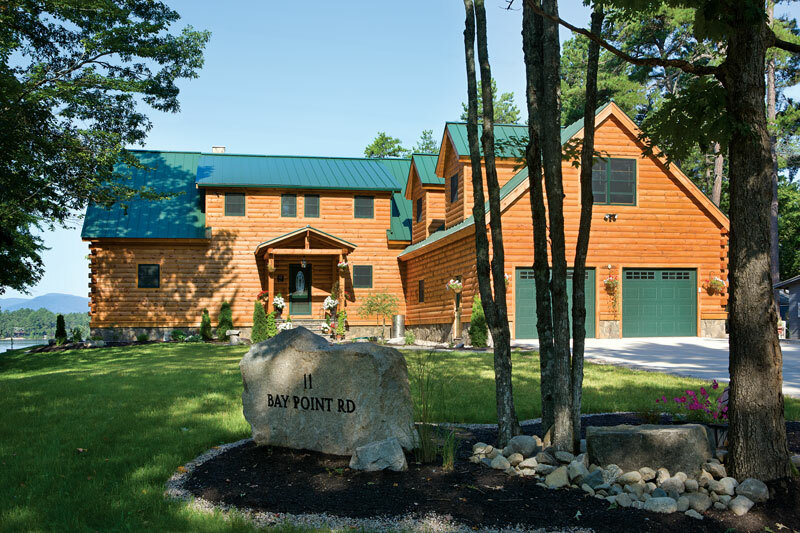 Greg and Kym hired Janet Hepburn of Ossipee’s Maidenstone Design, for the overall landscape design and hardscaping. The property’s original home had a two-ton rock in the basement that became essentially part of the home’s foundation. The Lagioses’ construction crew was able to remove it and break it into three pieces, which were then integrated into the landscape. One of the sections, placed near the driveway entrance, has the street address engraved on it. The homeowners handled most of the rest of the landscaping on their own, carefully preserving walls that the property’s original owner built with stones he collected on walks through nearby woods. 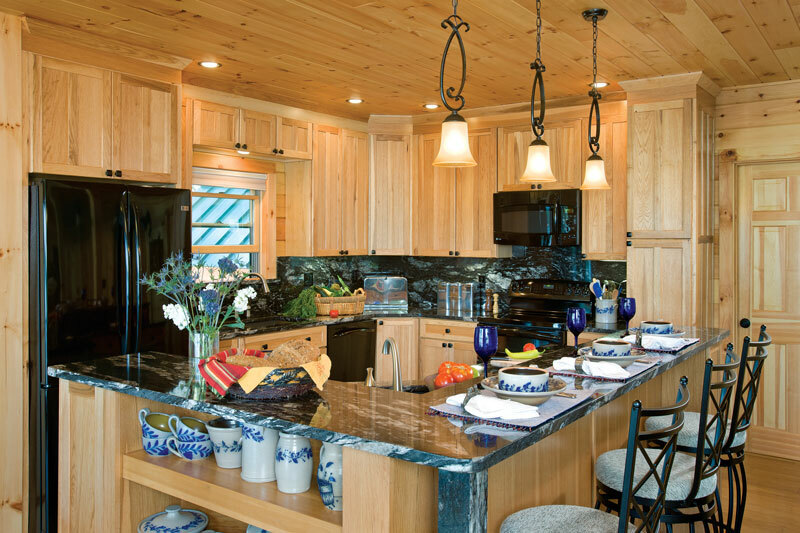 The couple chose the home’s lighting and plumbing fixtures, appliances and furnishings. Collaborating on the project was a positive, albeit painstaking, experience for Greg and Kym. The interior’s open, spacious rooms are free of clutter. The light-flooded great room with its natural bamboo flooring feels akin to a Japanese teahouse, only without tatami mats. The Lagioses feel their floor plan is perfect for their new lifestyle, which includes running a chain of Shop.com franchises. 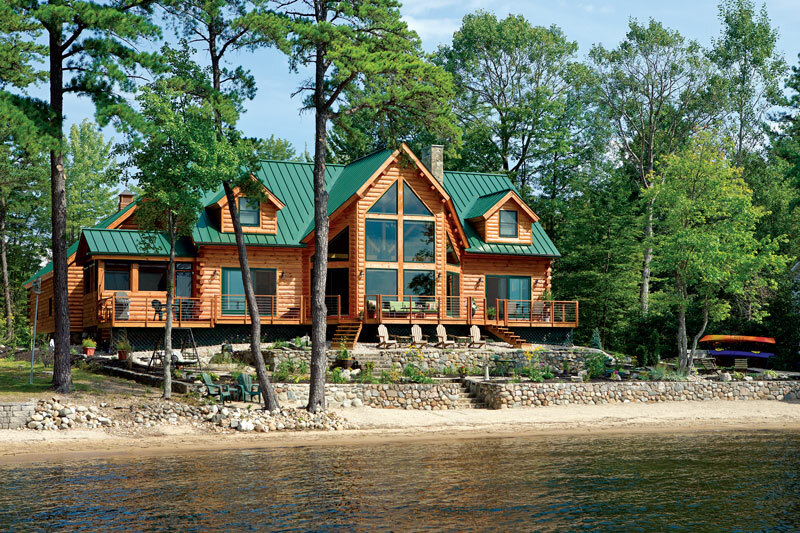 They especially like that their place is rural enough to afford plenty of peace and quiet, but located near the White Mountains, the Atlantic Ocean and Boston.